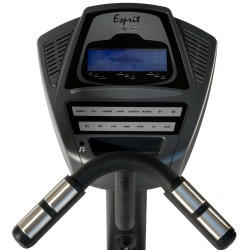 The Spirit Esprit EL-355 elliptical is an entry-level model with an impressive number of features from one of the top selling elliptical brands in the world. The large blue backlit LCD console shows time, speed, calories, program, rpm, level, distance, watts, and heart rate. There are ten programs including manual, 5 pre-set, 2 interactive heart rate, and 2 customized user workouts. Compare the current Spirit elliptical machines at their online store! The Spirit Esprit EL-355 elliptical features an ergonomic 20" fixed stride length, a 21-pound steel flywheel, sealed commercial bearings and premium bushings in the pivot points, and 16 levels of electronically controlled magnetic brake resistance. A set of concave durometer wheels on chrome tracks give the rider a fluid motion on every glide of the pedals. The moving handlebars give the user an upper body workout to incorporate full body training. The stationary arms located under the console have contact grip sensors for measuring your heart rate at any time. The Spirit Esprit EL-355 also comes with large self-leveling and cushioned foot pedals, a water bottle holder, transport wheels, a 325-lb user weight capacity, MP3-compatible plug-in, headphones jack, and built-in console speakers. There have been generally positive reviews on this model with owners happy with the ease of use, silent operation, and ergonomic feel. These hefty (172-pound) machines feel solid and offer a commercial quality ride. 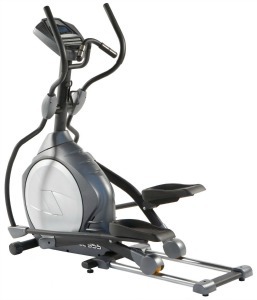 The Spirit Esprit EL-355 elliptical at $999 is an excellent basic model that compares favorably to competitor brands in this price range. You can sometimes find it at Costco for less, or check out the EL-455 which often sells for $999 as well. We should mention that you can get a Sole E25 elliptical with a better warranty, pedals with 2-degree inward slant, and a few more perks for $999 as well. Sole and Spirit are owned by the same parent company, Dyaco, and we feel you get a better deal in sub-$1000 models right now with a Sole machine.